See what I'm getting at? From left to right we have Mulberry, Mary Katrantzou and Kenzo. Spring/Summer 12 has been an eloquent lesson in being so print-tastic that even Jackie O's sunglasses wouldn't protect you from the glare. I would think that the 'me' of a few seasons ago - still revelling in the minimalist wave now synonymous with Phoebe Philo - would have laughed in the face of, say, double florals. But that was a few seasons ago. These days, I'm a convert, baptised in the church of digital printing. For this, I give thanks in part to a restoration of faith in the high street - there really are some great prints out there from Warehouse and Zara in particular - and in part to the one and only Mary Katrantzou. 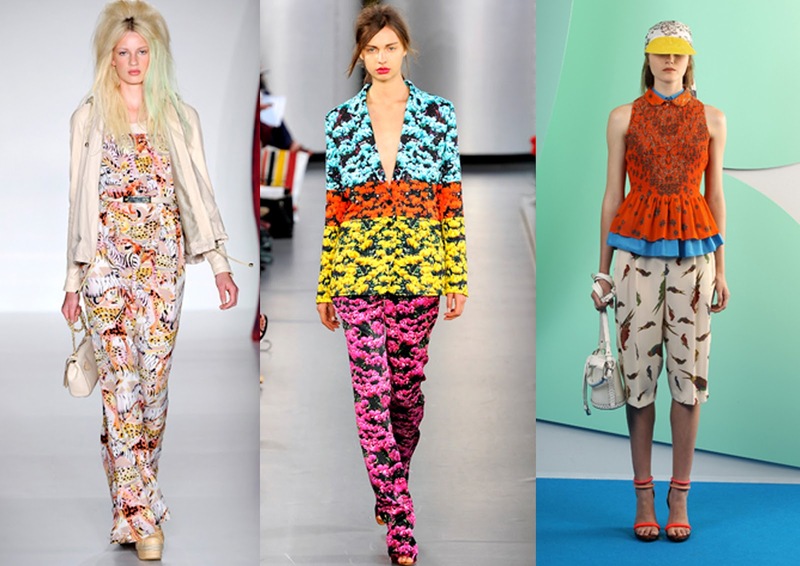 I mean, for goodness sake, who dip-dyes their models - already dressed - into multi-coloured beds of flowers and catalytically converts them into show-stopping, industry-praising, sell-out runway looks? If you're feeling daredevil (or simply, if you have deep enough pockets) then shop quick, because Mary K's pieces don't hang around for long. Sometimes, though, one does not find that many occasions that call for blue/orange/yellow/pink floral tailoring unless you're, say, Anna Dello Russo. For these occasions, why not try pairing it down? We've loved bird prints since Miuccia Prada told us to wear them - with the Peter Pan collar, of course - for which reason it would seem that society has become accustomed to seeing birds on our shirts. (By society, I mean anyone that would poke their eye out with a needle, for example, than take an interest n the latest trends.) 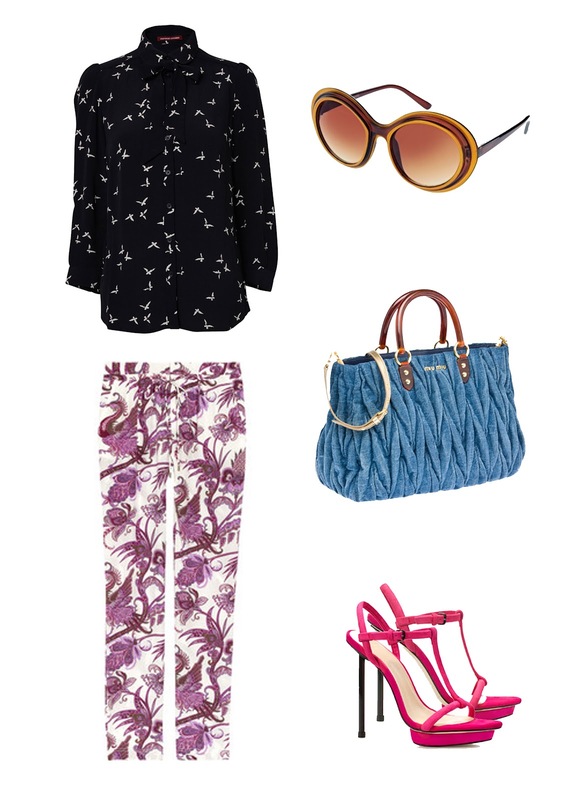 This shirt from Comptoirs des Cotonniers is a little tamer than what we've seen perhaps a little too much of recently, so perfect for teaming with something a little louder like these fabulous Gucci pants. A little touch of the 60's from ASOS and some colour-block heels (colour-blocking is a great way to break-up prints) from Zara and you're almost good to go. I must admit, the angel and devil on my shoulders had quite a debate about this Miu Miu satchel. Every fibre of my being wants to be against it, but for some reason, I'm just not feeling that denim-repulsion to which I am so very accustomed.